We opened for business on July 1, 1952 as Hamilton Standard Federal Credit Union, and started with 3,100 members (95% of HS employees! ), $679,000 in loans and $1,038,000 assets. All of our branches were located within Hamilton Standard buildings until 1994, when our first offsite location opened in Enfield, followed by our Route 75 Headquarters in Windsor Locks in 1995. Then in 2006 we opened our first high school branch at Enfield High School in Thompsonville. 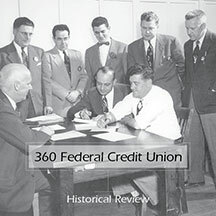 In 2008 we changed our name to 360 Federal Credit Union to better represent our changing membership composition and to position ourselves for future growth. In 2012 we acquired a small credit union in Simsbury. In 2015, we changed our charter from SEG (select employee group) based to Community charter based. The new charter now allows any person who lives, works, worships, volunteers or attends school in Hartford, Tolland or Middlesex Counties to become a member of 360FCU. Today we have over 17,000 members, and over $230 million in assets and growing! Are you looking for a challenging and rewarding position? If you’re interested in applying for a position at 360FCU, email your resume’ to hr@360fcu.org or fax it to (860) 627-4228.